President Bush signed legislation Monday creating a new Department of Homeland Security to lead the fight against domestic terrorism, but said even the biggest government shakeup in more than a half century can "neither predict nor prevent every conceivable attack." 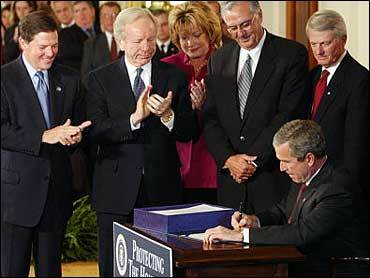 As he signed the bill at a White House ceremony, Mr. Bush said, "We're doing everything we can to protect America. But he warned, "In a free and open society, no department of government can completely guarantee our safety against ruthless killers who move and plot in shadows." Mr. Bush named close friend and current homeland security chief Tom Ridge to head the new department. He also said he will nominate Navy Secretary Gordon England to be Ridge's deputy, and Asa Hutchinson, the head of the Drug Enforcement Administration, to be undersecretary of border and transportation security. The president's signature launched the most sweeping federal reorganization since the Defense Department's birth in 1947. It's a huge shift in a bureaucracy that is often slow to change, reports CBS News Correspondent Peter Maer. The new department will take charge of the Coast Guard, Secret Service and 20 other agencies with 170,000 workers and a combined budget of about $40 billion. There are already questions about office space and even speculation about the emblems on uniforms. Agencies can begin moving to the new department 90 days after the plan is submitted to Congress. Mr. Bush plans to submit it almost immediately. The White House acknowledged the new department — an idea Mr. Bush initially opposed — will face "growing pains" and will not be fully operational for at least a yearm and perhaps two. "Wrinkles will have to be ironed out," presidential spokesman Ari Fleischer said. Ridge spokesman Gordon Johndroe said the new department's leadership structure will be in place within three months. But not everyone thinks the new department is a good idea, reports CBS News Correspondent Bill Plante. Intelligence expert James Bamford says it's a knee-jerk reaction to the attacks, done for public relations purposes, created in a rush, and it doesn't fix the system for sharing intelligence. He claims it not only won't increase efficiency, but may turn out to be worse than no change at all. "Instead of moving people together you should be moving information together," Bamford says. "You should be taking information and finding better ways to distribute it; faster ways to distribute it among people." Signing the homeland security bill ends an odyssey for legislation that started inching through Congress nearly a year ago against Mr. Bush's opposition, only to see him offer his own version after momentum became unstoppable. The bill became snarled in partisan disputes on Capitol Hill, with Democrats refusing to grant the president the broad powers he sought to hire, fire and move workers in the new department. Mr. Bush would not yield, and made the disagreement a political issue, railing against Democrats as he campaigned for Republican candidates through the fall. Democrats reversed course after their Election Day loss of Senate control was attributed partly to the homeland security fight. The road to passing the homeland security bill was tortuous to the end. Senate Republican leader Trent Lott of Mississippi phoned House Speaker Dennis Hastert, R-Ill., in Turkey and won his pledge that Congress next year will reconsider three provisions that moderates opposed. One provision permits federal business with American companies that have moved their operations abroad to sidestep U.S. taxes. Another measure legally shields drug companies already sued over ingredients used in vaccines. Democrats said this includes claims that mercury-based preservatives have caused autism in children. Also re-examined will be a section that helps Texas A&M University win homeland security research money. The district of incoming House Majority Leader Tom DeLay is near Texas A&M. Earlier Monday, Mr. Bush signed port security legislation, which he says will protect the nation's coasts and harbors by adding port security agents, restricting access to sensitive areas and requiring ships to provide more information about the cargo, crew and passengers they carry.